Happy Wednesday and welcome to Fall Fashion Frenzy with The Blended Blog. Today we're talking about our favorite jeans, and I'm excited to see what you guys are wearing. I own a few higher end pairs, and of those my favorite is 7 For All Mankind. Or maybe my Ag straight leg jeans. I guess I like them equally. But honestly, Old Navy has been on point with their jeans recently, especially the Mid-Rise Rockstar style, and that's what I'm wearing most days. I wrote a post about them last spring, and they've continued to improve. No dreaded muffin top, no sagging and bagging after an hour. They come in so many styles, colors, and finishes, and the price is always right. Side note: never pay full price for anything at Old Navy, because it's guaranteed to be on sale the next day. 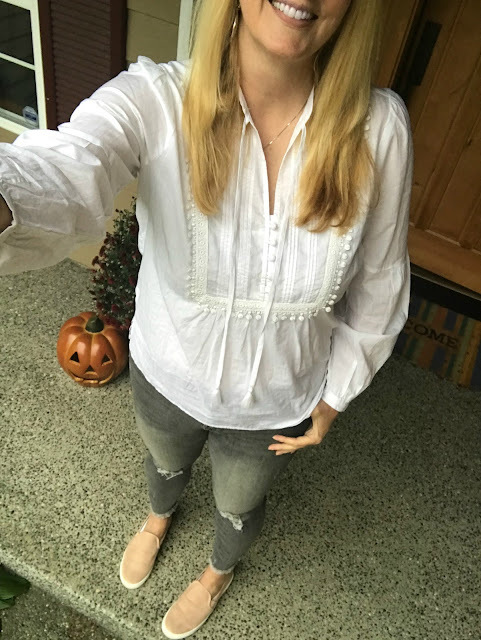 One of my favorite ways to wear jeans is with a white t shirt or blouse. This dressier one from Loft has lots of fun details, and I liked it with the distressed jeans and blush sneakers. As it gets colder I'll add a moto jacket or cardigan. The questions is, what would Stacy London have to say about jeans? On the show, I remember her being a fan of classic styles and dark washes. Yep, the book confirms it, although she also mentions a pair of straight leg jeans being a closet staple. Stacy's okay with trying something fun that feels modern or relevant, like colorful or waxed denim. But she probably wouldn't like my fringey distressed gray jeans from Old Navy. Her final word on the matter: "noone in the world - of any size or age - can't rock a good trouser jean". Add trouser jeans to my shopping list. In other news, this was the first week in forever that I was on my own for taking pictures. And I failed. Kinda sorta in my defense, it rained for the last few days so actually going outside wasn't an option. Must plan a little farther in advance. Or get my friends to take them for me on our girl's weekend. I love wearing white with jeans..so crisp and chic and you look darling. What a sweet little top too!! Will miss you so much this week! Great pair of jeans. I have to admit, I've given ON a few dollars lately and found some rockstars that are fabulous! I think you did great taking your own pictures, Lana! My arms are too short that I can never take them myself so I think you are very fortunate to not necessarily need assistance. I live in my favorite pair of jeans, too! AG are my favorite jeans but I haven't bought a pair in years. Those ON jeans are so cute on you! It's hard to take your own pictures but yours turned out great! I haven't tried Old Navy's Rock Star jeans in so many years. But maybe I should since I totally trust your style judgement! I think even Stacy has gotten more lax in her opinions. Do you ever see her on IG?? She's more adventurous and tries new styles. So I will say...these jeans are a winner!! I am totally taking a million pictures of you this weekend, fyi. I love Stacy London and I love Old Navy denim too! The mid rise Rockstar is where it is at and you are so right - there is ALWAYS a sale! Lookin' good in these Lana!!! I think I have to give ON another try for their jeans. Before I felt like they were so thin and you couldn't see every roll of everything! Going to have to try them again! These look great! I do love ON Rockstar jeans, but I think AE has my favorite all time jeans as of lately. Yet, I like a variety, so I'm still buying the ON Rockstar ones occasionally! :) I love that white top, it's still simple yet kinda fun! I totally love the Rockstar jeans and jeggings. I really won't wear anything else, except leggings or jeggings from mail order. Old Navy rocks it! I love that they are your favorite jeans because they look great on you Lana. Grey jeans are so cool too and I love them with ivory or white. Such a pretty boho blouse!